This study investigated a methanol extract from the leaf and stem of Vitis amurensis (Vitaceae) for possible neuroprotective effects on neurotoxicity induced by amyloid β protein (Aβ) (25–35) in cultured rat cortical neurons and also for antidementia activity in mice. Exposure of cultured cortical neurons to 10 μM Aβ (25–35) for 36 h induced neuronal apoptotic death. At concentrations of 1–10 μg/mL, V. amurensis inhibited neuronal death, the elevation of intracellular calcium ([Ca2+]i) and the generation of reactive oxygen species (ROS), all of which were induced by Aβ (25–35) in primary cultures of rat cortical neurons. 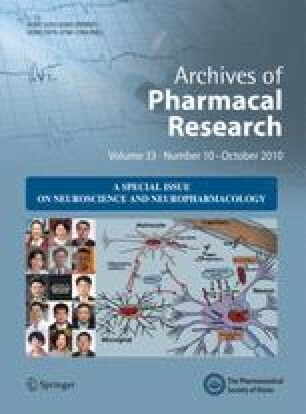 Memory loss induced by intracerebroventricular injection of ICR mice with 16 nmol Aβ (25–35) was inhibited by chronic treatment with V. amurensis extract (50 and 100 mg/kg, p.o. for 7 days), as measured by a passive avoidance test. Amurensin G, r-2-viniferin and trans-ɛ-viniferin isolated from V. amurensis also inhibited neuronal death, the elevation of [Ca2+]i and the generation of ROS induced by Aβ (25–35) in cultured rat cortical neurons. These results suggest that the neuroprotective effect of V. amurensis may be partially attributable to these compounds. These results suggest that the antidementia effect of V. amurensis is due to its neuroprotective effect against Aβ (25–35)-induced neurotoxicity and that the leaf and stem of V. amurensis have possible therapeutic roles for preventing the progression of Alzheimer’s disease.